Once I had a project where it was necessary to store and retrieve properties with little effort. I found the article “Setting Properties with OLE Automation” by Konstantin Boukreev very useful for this purpose. He wrote the ActiveX control which gave an opportunity to manipulate properties in VB IDE property browser through IDispatch interface. This was made to make my Properties COM object unique per process. The next problem I met was that there was connection string among my properties. It was not a good style to edit it as a string. 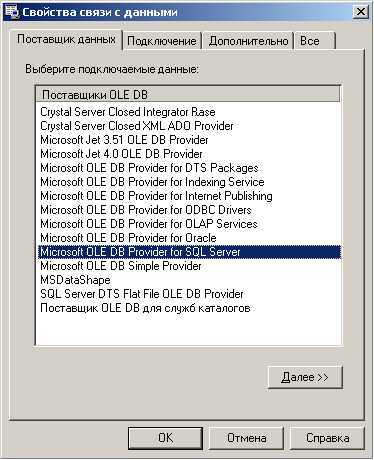 For example if you work with OLE DB or ADO you know common dialog for data link properties selection. Sorry for Russian captions 🙂 Couldn’t find non Russian operation system. and to add GUID_DATASOURCE definition to propguids.h file. only for editing the connectionString property of my COM object.